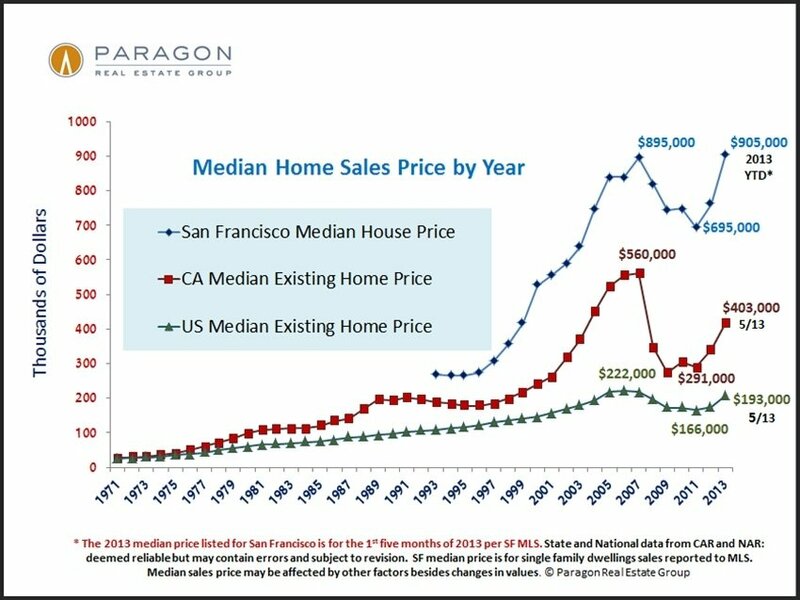 This chart breaks down the rise in SF home values occurring over the past 2.5 years. Though it appears that 2013 prices surged after the first quarter, the surge actually started in March, which is when the market really started to reflect offers negotiated in 2013. January and February sales mostly reflect the holiday season market, when the higher-end home market typically checks out. We prefer quarterly or longer time periods because they make for more reliable statistics: monthly statistics often fluctuate without great meaning. The high overall median prices achieved in March-May may drop somewhat during the summer due to seasonal and other factors. 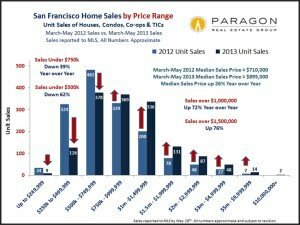 These 4 SF Realtor districts generate a lot of house sales, so they’re good for statistical analysis. For 2013, this chart looks at the last 5 months of sales-if assessing just the last 3 months, 2013 numbers would typically be higher. 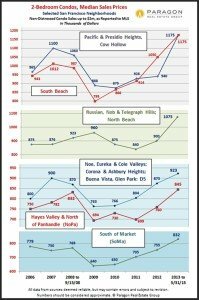 The central Noe-Eureka-Cole Valleys district, a hot bed of high-tech buyer demand, has soared well beyond its previous peak value in 2008. 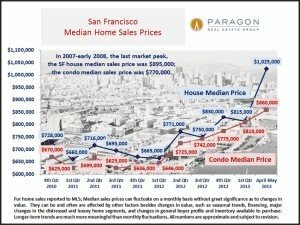 The very affluent northern district of Pacific Heights-Marina has also exceeded its previous peak. 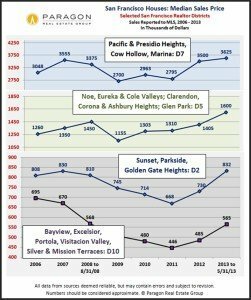 Sunset-Parkside in the southwest has regained its 2007 peak, and the southeast Bayview-Portola-Excelsior district, which was hit hardest by distressed sales, while recovering rapidly, has not yet made up the value lost since its 2006 peak. This district, with more house sales than any other, lost more percentage value in the downturn (25-45% depending on neighborhood) and so has more ground to make up. But it’s well on its way. These 6 areas of the city generate high numbers of condo sales, which is why we chose them for this analysis. Condos in all these areas have increased in value beyond their previous peaks in 2006-2008; some of them, such as South Beach, dramatically so. 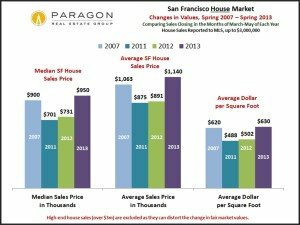 This link illustrates how, over the past 5 years, the SF market has switched from being dominated by house sales to condo sales; with the continuing construction of large condo projects, we expect this trend to continue. TIC sales have dropped significantly, both as a percentage of sales and in actual unit sales: This is due to a number of complex issues such as changes in city condo conversion and tenant protection regulations. There are 3 main underlying currents occurring in San Francisco. First is the rapid dwindling of distressed property sales: Thus, sales under $500,000, the price range of most distressed sales, have dropped by 62% since last year. This segment is on the verge of disappearing completely in SF. Second is the dramatic resurgence in luxury home sales: the affluent have profited most from the economic recovery and the city also has large numbers of the newly affluent (often high-tech) who wish to buy homes. So, sales of homes costing $1,500,000 plus have surged by 76%. The third dynamic is simply the general appreciation of home values. All 3 factors add up to a large migration from lower-priced to higher-priced sales. Note: The medians quoted on this chart are for many different property types combined. 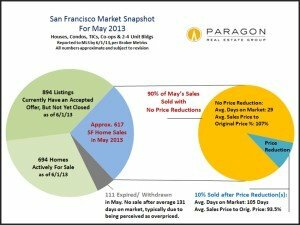 A clear indication of the red-hot heat of our market: 90% of SF home sales closing in May sold without going through any price reductions, at an average sales price 7% higher than the asking price and a very low average days-on-market of 29 days. These are very dramatic statistics illustrating the high demand/low supply situation here in the city. 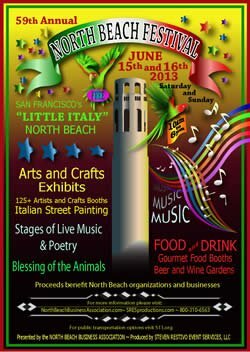 The 59th annual North Beach Festival is considered one of the country’s original outdoor festivals with Washington Square Park and several neighboring blocks taken over in this giant two-day street fair. 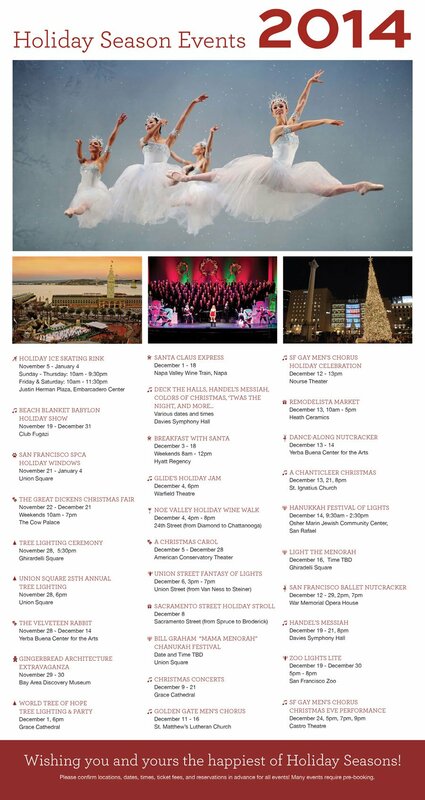 With three stages for entertainment over 125 arts and crafts booths, 20 gourmet food booths, Italian street painting, beverage gardens and the blessing of the animals, there’s sure to be a little something for everyone. Live music fills the streets of “Little Italy” during the two-day long Festival. Renewing the older traditions of when North Beach was a complete and thriving community, the sights, sounds, smells and flavors available will recall the strength and passion of San Francisco’s Italian heritage. 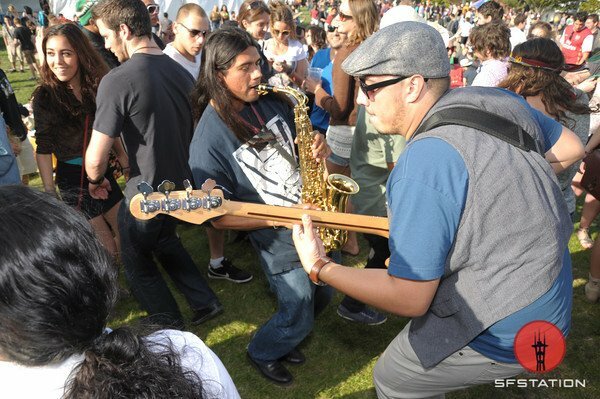 Free to attend and family friendly, the North Beach Festival is sure to delight summer festival goers. Once a year, on the second Sunday in June, the Haight-Ashbury community hosts a special celebration and everyone in the World is invited. Music is in the air, people dance in the streets, a festive atmosphere springs up and Haight Street, once again, becomes the center of Peace, Love and Happiness. The Haight Ashbury Street Fair is one of the most highly anticipated public events in San Francisco. The fair stretches along Haight Street from Masonic to Stanyan Street and features a main stage of entertainment at each end, but you never know who will be appearing as the line-ups are never advertised. The event attracts over 100,000 people who take to the streets in an atmosphere reminiscent of the Summer of Love for which the event is famous. This, the 35th anniversary celebration, promises to live up to its world-famous reputation with entertainment for families with children, many local bands, top-drawer comedy, music, food and drink and an opportunity to celebrate with many other like-minded people. Admission to the Fair is free, so don’t miss out on this joyful and historical event. The 102-year old Zazzle Bay to Breakers 12k is one of the world’s largest and oldest footraces, held annually in San Francisco, California. The name reflects the traditional course which takes tens of thousands of participants from the northeast end of downtown near The Embarcadero (the bay side of the city) to the west end and the breakers of Ocean Beach. Originally started as a spirit-lifter of civic morale after the devastating earthquake and fires of 1906, the 7.46 mile race features world-class athletes, costumed runners and fun loving participants out for a great day of running or walking through beautiful San Francisco. This historic event is USA Track & Field certified and registration is required, but this isn’t just a race for the serious runner. In the true spirit of San Francisco, the race is a celebration for everyone. Families, weekend runners and walkers, and thousands of costumed participants (there’s a contest for the costumes, too!) make their way through the heart of the city cheered on by 100,000 spectators, cheering and bursts of live music. Throughout its long history, Bay to Breakers has been a showcase for the City’s irrepressible color, spirit and affection for eclectic traditions. This is a quintessential San Francisco experience and a true reflection of the heart of the city. Start location: See website for appropriate placement.